The following interview features Erika Washburn, Manager of the Lake Superior National Estuarine Research Reserve in Superior, Wisconsin. Erika has a PhD in natural resources and earth systems sciences, a MA in anthropology/nautical archaeology, and a BA in marine science/biology and archaeology. In addition to talking about her career path and current role, she discusses the value of the social sciences in solving natural science problems, including her work with coastal systems. Tell me about your anthropology background and your career path. What drew you to anthropology and nautical archaeology specifically? I think from a very early age I was always interested in cultures and “otherness,” and I saw myself frequently looking from the outside in, probably encouraged by perusing the maps and pictures in National Geographic! In college, I was taking anthropology classes for fun while pursuing a degree in marine biology, but as it happens, I got hooked. I wound up double majoring and taking more and more classes in anthropology and archaeology, which led to my first field school in coastal northwestern Greece. While studying at the Marine Biological Lab in Woods Hole a short time later, my biology mentor said something to me which turned out to be not only prescient but also really good professional advice, which was in order to make an impact in the environmental challenges of the future, one must have a solid foundation in the social sciences. I took that to heart and pursued a Master’s in Anthropology, focusing on coastal systems at Texas A&M University’s Nautical Archaeology Program. I think having grown up both near Lake Michigan and in San Diego, I was always fascinated with the relationship between coastal systems and society over the long term. This program gave me a place to study that relationship in a really fun way! You have a PhD in natural resources and earth systems sciences. What made you decide to go in this direction? What is the relationship between your MA and PhD? I have a PhD in an interdisciplinary program focused broadly on natural resources and earth system sciences. I took time off between my MA and PhD, but it was the experiences gained during the course of my MA degree that led directly to the research questions and ideas that formed the basis of my dissertation years later. You used social science research methods for your dissertation research. Isn’t that uncommon for people in the natural sciences? The lab group in which I was involved was incredibly multidisciplinary, and my adviser, a fisheries biologist and policy expert, was very supportive of social science techniques applied to natural resource issues. In our lab group, there were several grad students using elements of applied social science research techniques to study coastal system challenges such as fisheries policy, ecosystem-based management and, in my case, land use decision-making in coastal watersheds. I think it is still all too uncommon for people in the natural sciences to experience or witness the strength of applied social science techniques, but I was in a very special lab group and benefited from a rather unique individual leading that group, Dr. Andy Rosenberg. His open mind, support for social science, and involvement in the multidisciplinary, global Census of Marine Life, created a supportive environment for the social scientists in the lab. For example, in my PhD work, I used an anthropological approach to develop a social landscape analysis while collecting narrative data on land use decision-making. I recall numerous examples of conducting semi-structured interviews, and in the process of actively listening to respondents, I could hear them contradict themselves or state mutually exclusive beliefs or other complex sentiments. I was comfortable in those circumstances just letting them roll with their explanation and talk out their thoughts, which often led to further reflections, clarifications and, always fun for me, the creation of teachable moments. What do you do in your role at the National Estuarine Research Reserve? 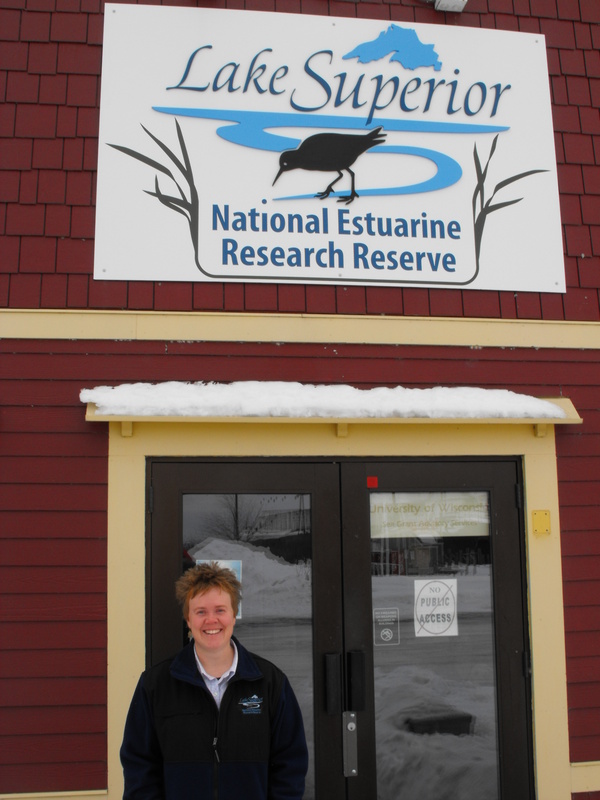 I am the Manager of the Lake Superior National Estuarine Research Reserve (NERR) in Superior, Wisconsin. It’s my dream job. My PhD work was actually carried out in the watershed of the Great Bay NERR in New Hampshire, so I was familiar with the NERR system, which is legislated through the Coastal Zone Management Act, administered through federal-state partnerships, and led by the National Oceanic and Atmospheric Administration. There are 28 NERRS in the nation, and Lake Superior is the newest. As the only manager who is an anthropologist, or social scientist for that matter, I have a unique role to play. I want to truly integrate the natural and social sciences in support of our mission of long-term research and monitoring, education, and stewardship of our coastal systems. Our ultimate goal is, through non-advocacy, to deliver information that improves how society makes decisions affecting coastal systems, and that leads to the behavior and social change required to adapt to challenges like climate change. I am excited about bringing in research questions, methods and practices from the social sciences and anthropology in particular and helping my staff connect with social scientists and students who can partner in this endeavor. In this leadership position, every single day is totally different. I keep the facilities operational, oversee budgets, hire and evaluate staff, create and maintain community partnerships, apply for grants and resources, and serve as a buffer between my staff and the daily “fires” so they can focus on their jobs. Every day really is unique; I could be handling building security concerns, negotiating with the university administration about new HR protocols, advising students, paying bills, buying a new dock for our boat, meeting with local business leaders, etc. It is fun! I didn’t think that would be the word I would use to describe my job – but it is really, really fun, and I think much of what I learned in the practice of anthropology positions me for success. How do you apply anthropology (theory, skills, perspectives, etc.) in your job, especially given that it’s in the realm of natural sciences? I apply aspects of anthropology to my current job through frameworks such as collaborative or action learning. Also, many of the cutting edge natural resource-related funding mechanisms now demand two things: 1) framing work through ecosystem services, which requires the inclusion of social, cultural and economic information and 2) including stakeholders/end users in the entire design and implementation of research to management and policy. In order to do either of these things, you have to make sure that those who are underrepresented, those who have fewer resources, and those with quiet voices are also present. Anthropology excels at building this necessary and inclusive community. Also, to practice applied interdisciplinary research as we are charged to do, we must use techniques like focus groups, qualitative analysis of narratives, and mental models – all originating in anthropology and related fields. What was the most useful skill you learned when training in anthropology? Listening is the most important skill I learned in studying anthropology. It is absolutely required in order to begin to understand practices, beliefs, attitudes, values, perceptions and other aspects of our shared existence in time and place. What was your favorite project or class from your anthropology training? I am proud of my PhD work in New Hampshire, especially since it led to real social change on the ground. I would love to find some grad students and replicate that study and approach in my new position here in the Twin Ports and with the Lake Superior NERR. I also have fond memories of the advanced evolutionary anthropology courses I took, and I thoroughly enjoyed teaching this topic while living in Denmark. If I could go back to school for fun in the future, I might very well pursue study in evolutionary anthropology. Is there anything you think anthropology training programs could do better to students for the working world? There are so many different ways that anthropology can be useful beyond academia. Anthropology training programs should develop structured mentoring opportunities for students across a wide spectrum of career fields. I think it would be a great service to students to present them with examples of the range of careers and fields which anthropology can be applied and the variety of successful career paths that can be developed using anthropology. As a student myself, I worked through college and grad school, but I also participated in internships, fellowships, and teaching and research assistantships. I took advantage of every open door that presented itself and kept an open mind when applying for long shot experiences – like my Fulbright! Students should take advantage of every opportunity they have to request informational interviews with people in interesting professional positions. Leave no stone unturned! Personal connections will always matter the most with job seeking and the more students engage professionals, seek advice and listen to other perspectives, the better positioned they will be to find those open doors.